Basically, enabling this option will make registrations be automatically validated in your tournament, following their creation date order, and up to the tournament size (once the tournament is full, additional registrations will remain pending). As the organizer, you are still free to act on registrations (validating registrations over the tournament size, refusing validated registrations etc.) and can disable / re-enable the option at will. Automatic validations might not be processed instantly and take a few seconds. With the option enabled, a participant that edits his validated registration will remain validated. 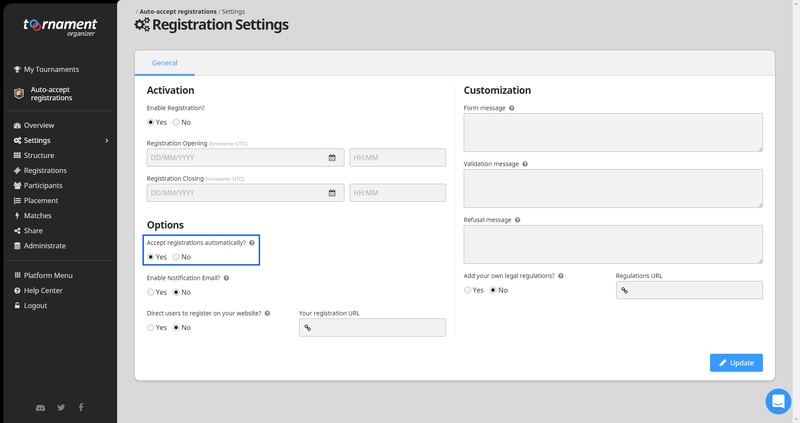 You have to disable the option to delete a registration if it keeps being auto-accepted when you try to reset it. A new registration will automatically be validated if there is still room in the tournament. If a participant cancels his validated registration and there is still room in the tournament, the next registration in line (based on the Creation Date of the registration) becomes validated. Refuse a validated registration, that can not be automatically accepted anymore, and frees up a slot, automatically accepting the next registration in line. Leads to the validation of the next registration in line, if there is still room in the tournament. Will be the same registration if the registration was validated, and is the first in line. If an organizer reduces the size of his tournament under the number of current validated registrations, then he will be prompted with a message informing him that he has too many participants, but the system will not refuse or cancel registrations automatically. On the other hand, increasing a Tournament Size, to accommodate more registrations, will automatically cause registrations to be accepted again if there are free slots available in the tournament, and pending registrations awaiting. Deleting a participant cancels his registration, leading to a possible free slot.